Wedding invitation history is intriguing. The reason ancestors first issued invitations for this special day may surprise you. The techniques used to design and create attractive wedding invitations were quite different from those of today. Wedding invitation trivia offers some interesting historical insight. Exploring the history of invitations for weddings provides inspiration for your own wedding invites! There are actually documented cases of wedding invitations found in caves, but by the early 1700s, wedding invitations were typically verbalized. In fact, they were usually issued in a loud manner. If someone heard the invitation, they could attend the wedding, unless of course there was bad blood between the families. These invitations were typically announced by a town crier. Why weren't the invitations handwritten? Many people simply couldn't read, so the invitations had to be orally announced. Of course, this didn't apply to the wealthier families and royal families. Monks were well-known for their beautiful handwriting. Their calligraphy was highly coveted, and they were often commissioned to write wedding invitations by those who could afford to do so. Many of these families also had the family crest added to the invitation. This was also used as a means for identifying the family to those who were virtually illiterate. You know that delicate piece of tissue paper that is usually placed inside of a wedding ivitation? Why is it there? There's actually an interesting piece of history behind that small piece of paper. Metal plate engraving was invented by the 1600s. Because the engraving would easily smudge, a small piece of paper was placed on top to prevent this. That custom was simply passed on to preserve the delicate printing of wedding invitations and continues to be commonly used today. What's with all the envelopes? Why are wedding invitations sent in two envelopes? Wouldn't one suffice? Once again, this custom follows history. Before the 20th century, the postal service wasn't very reliable. In fact, it was nearly nonexistent in certain areas. The only guaranteed way to deliver a wedding invitation was by hand delivery, usually sent by a hired courier or servant of the family. Since many of these deliveries were by horseback, the envelope might not arrive in the cleanest condition. Thus, the double envelope was designed. Once the courier reached his destination, he handed the invitation to the butler or housemaid, who then removed the outer envelope and handed the inner envelop along with the invitation to the master or mistress of the house. Since a local wedding might be considered the social event of the year, sometimes families wished to limit the actual guests, ensuring that undesirables did not attend. In this case, the invitations typically included a card which was to be presented upon arrival at the ceremony. For those families who really wanted to be organized, pew numbers were also assigned to the wedding guests, and this number would be placed on the card. 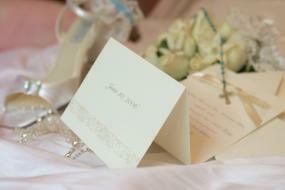 As you can see, many of the customs that began in history long ago concerning wedding invitations still apply today. While the wording might have changed and formalities have slackened somewhat, the main idea remains. Be sure and check out all of the other great articles on wedding history at LoveToKnowWedding. You'll be surprised at what we've found out!